I got up feeling better than I have in months! That said, I made this card on Weds. when my gal pal Deb came to visit. But It was lacking something. 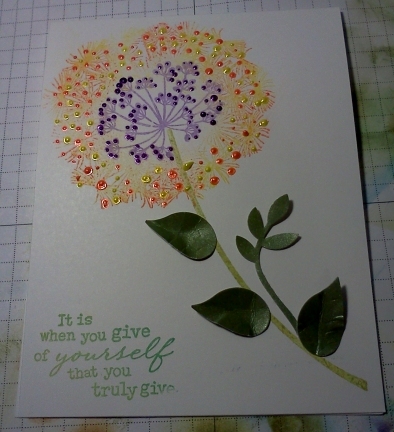 I had just stamped the image and added the punched leaves. It was flat and quite frankly "bleh". So this morning, feeling all chipper I decided to add some Ranger Liquid Pearls. I am lovin' it NOW! So, my thought for you is, if ever you create something and you are not completely happy with it; WALK AWAY. Leave it. Go do something else. Then when you are of a fresh mind, go back and see what you can do to make it an "I LOVE IT" project. Hope today you have a little "Spring" in your step! What a pretty card! I love the sparkle on it -- those perfect pearls were a great addition. Thanks for joining us at the Paper Players this week! Very pretty...I agree, sometimes you just need to walk away from your project! Thanks for sharing this with us at the Paper Players!